Convenient parking is available near the Allen Center in downtown Houston. Click on the map shown for more information on parking, including rates, hours of operation, and entrances. The Allen Center is a skyscraper complex located in the heart of downtown Houston. The property features five buildings, One Allen Center, Two Allen Center, Three Allen Center, Allen Center Clay Street, and Five Allen Center. Convenient and abundant parking is available in two attached garages, in addition to three VIP basement garages located under each office tower. 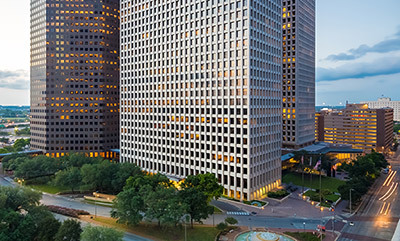 The Allen Center offers easy access to many downtown amenities such as direct connection to Houston's tunnel/skywalk system, an interconnected sky bridge to adjacent buildings, as well as numerous Metro bus stops, restaurants, and retail shops.